I am going to quickly talk about my absolute LOVE (#obsession) for file folders! As Special Educators, we are always looking for different, interactive, and fun ways to teach our students new skills. What better way to do that than with file folders?! They are cheap, pretty easy to put together, can be used 1:1 or independently, and they will last you for years if you prep them correctly!! This last summer, I got the idea to start making file folder activities for each month of the school year. My students (and I'm sure yours too!) will often be working on the same skills for a whole school year, or even longer! Man oh man can that get BORING. I mean, how many times can that poor child count bears up to 20? A few weeks in, even I'M banging my head against the wall. Bring in, themed file folders! These are my Back to School File Folders for September! Each month I have a mixture of themed file folders with sight words, counting, ABC match, ABC order, big/small sort, etc. This has been SO helpful to keep my kiddos on their toes, and they are always looking forward to when we switch out the file folders! Best of all? After this year, we will be SET for next school year! These are a few of the file folder activities we used during November. Each month we have 20 new folders to use! Click HERE to check out this growing bundle of file folders for the entire YEAR! Also new to our growing set (again, obsession) of file folders are some Science & Social Studies File Folders! We are LOVING using these to hit the different Elementary Science & Social Studies standards! These have been great to have around after teaching a standard, such as animal habitats, to continue working on it independently! Click HERE to check out the bundle of Science & Social Studies file folders! 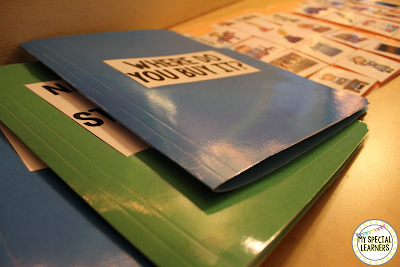 Do you use file folder activities in your classroom?! Hopefully I'm not the only one with the #filefolderobsession! Enjoy the rest of your winter break, friends! !